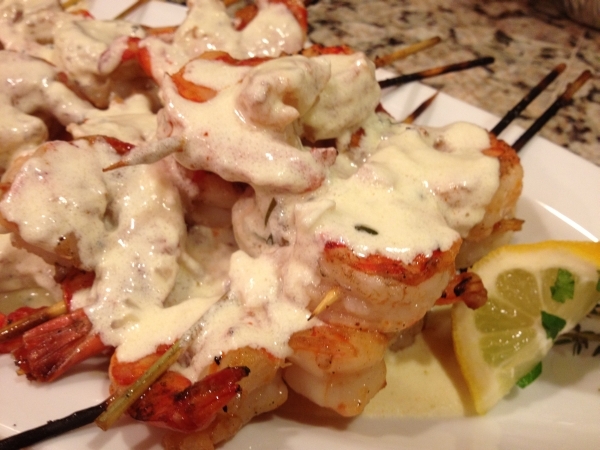 I was looking through images recently and came across these photos of these shrimp skewers, served with cream sauce that we had as part of a special Wine Dinner that Bill and I hosted back in early December of 2012! 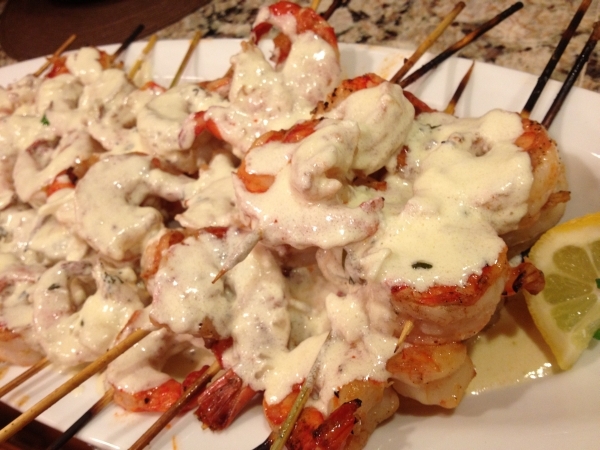 Boy they look good that I’m thinking I will have to make some more now that the spring season is just about here, allowing me to grill more frequently! The shrimp was a part of the first course of that wine dinner, paired with a 2011 Reserve Chardonnay from Beau Vigne and it was delicious! Melt butter over medium heat in a sauce pan. Add the minced shallot and cook over low heat stirring constantly until they are translucent. Add the garlic and stir it cooking for an addition minute or two and try to avoid any browning. Stir in the white wine and bring the heat back to medium cooking until the wine is reduced by about half. Sprinkle the flour over the mixture while continuing to whisk to create a roux. Cook for an additional two to three minutes to cook out the raw taste of the flour. Slowly add about half of the cream and keep stirring. After about a minute, the sauce will begin to thicken. Then add the rest of the cream while you continue to stir. The sauce will again begin to reheat and become thicker within three to five minutes. Once it reaches your desired consistency, turn heat to low. Squeeze a dash of fresh lemon juice and taste. Season with salt and pepper. Either serve the sauce poured over the shrimp skewers, or set aside and allow guests to apply as much as desired.